A GMC Sierra Denali pickup on display at the Los Angeles Auto Show in November. GM plans to roughly double its overall investment in GMC over the next decade, when it hopes GMC will capture 5 percent of the U.S. light-vehicle market. 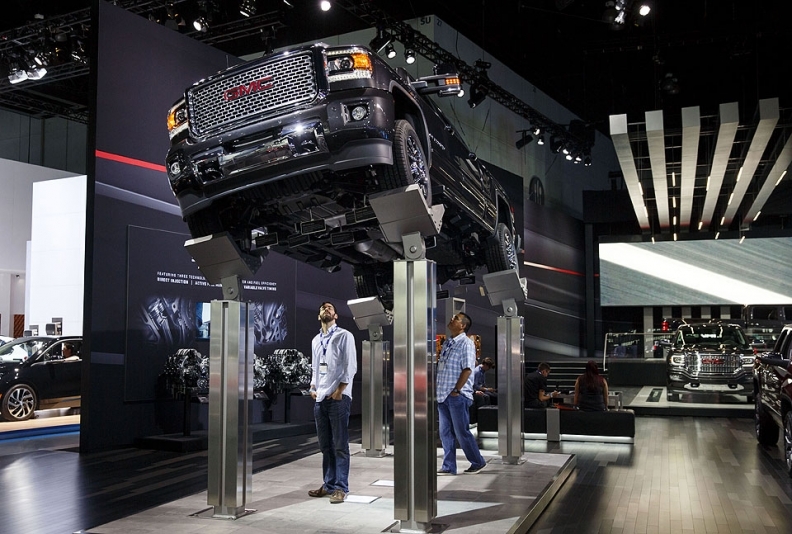 DETROIT -- GMC is wrapping up its biggest year ever for marketing spending. Next year, it'll dole out even more. GMC chief Duncan Aldred, citing third-party survey data that measure "brand momentum," says the "Precision" campaign that General Motors' truck brand has been running since spring has boosted GMC's image. GMC will roll out a 2.0 version of that campaign starting in January, with heavy use planned for NCAA football bowl games. The marketing push is part of a broader strategy to raise GMC's market share to 4 percent by 2019, from 3.2 percent through 11 months of 2015. GM plans to roughly double its overall investment in GMC over the next decade, when it hopes GMC will achieve 5 percent market share. Aldred described this year's marketing boost as "the first tranche" of that investment. It will grow this year partly to support a major vehicle launch, though he declined to name the entry. GMC is expected to introduce the next-generation Acadia crossover in the second half of 2016, industry sources have said. This year's marketing effort has lifted GMC's upscale Denali line specifically, Aldred said, driving sales to more than 25 percent of the brand's overall volume in both October and November, from an average of around 20 percent in recent years. The campaign has included several Denali commercials, the first significant ad support for the subbrand since it was launched on the 1999 Yukon SUV. Aldred: Denali line got a lift. Denali's rise lifted GMC's average transaction price to a record $43,047 in November, up $2,230 from a year earlier, according to data provided by GM. Overall, GMC's U.S. sales rose 11 percent through November, to 498,756 vehicles, double the industry's 5.4 percent growth rate. "The contribution that GMC will make to the company this year in terms of profitability will be exceptional," Aldred said in an interview this month. The "Precision" campaign, created by Leo Burnett, has used imagery from the worlds of fashion and sports to highlight the craftsmanship of GMC's vehicles -- a baseball pitcher zipping a fastball across the corner of the plate, for example. Aldred said the campaign's next phase will better tie in to GMC's long-standing Professional Grade tag line. It will also showcase more vehicle features, such as power running boards on the new 2016 Sierra Denali Ultimate that electronically extend rearward to provide access to the front of the bed. "We won't be out there running down the mpg or towing capacity, but we'll be talking about those little details," he said. "Those things that say,'This is why GMC is better.'"